Issue 8.9 is now online! This issue contains two Applications articles and three Open Access articles. These five papers are freely available to everyone, no subscription required. – qfasar: A new R package for diet estimation using quantitative fatty acid signature analysis methods. It also provides functionality to evaluate and potentially improve the performance of a library of prey signature data, compute goodness-of-fit diagnostics, and support simulation-based research. – biomass: An r package designed to compute both AGB/AGC estimate and its associated uncertainty from forest plot datasets, using a Bayesian inference procedure. The package builds upon previous work on pantropical and regional biomass allometric equations and published datasets by default, but it can also integrate unpublished or complementary datasets in many steps. In the first Open Access article for this week, Matthew J. Silk et al. present a practical guide to the application of network modelling frameworks for hypothesis testing related to social interactions and epidemiology, illustrating some approaches with worked examples using data from a population of wild European badgers Meles meles naturally infected with bovine tuberculosis. In ‘The application of statistical network models in disease research‘ the authors argue that statistical modelling frameworks designed specifically for network analysis offer great potential in directly relating network structure to infection. Targeted enrichment of conserved genomic regions is a popular method for collecting large amounts of sequence data from non-model taxa for phylogenetic, phylogeographic and population genetic studies. In ‘Identifying conserved genomic elements and designing universal bait sets to enrich them‘ — our second Open Access article — Brian Faircloth describes a universal workflow for identifying conserved genomic regions in available genomic data and for designing targeted enrichment baits to collect data from these conserved regions. 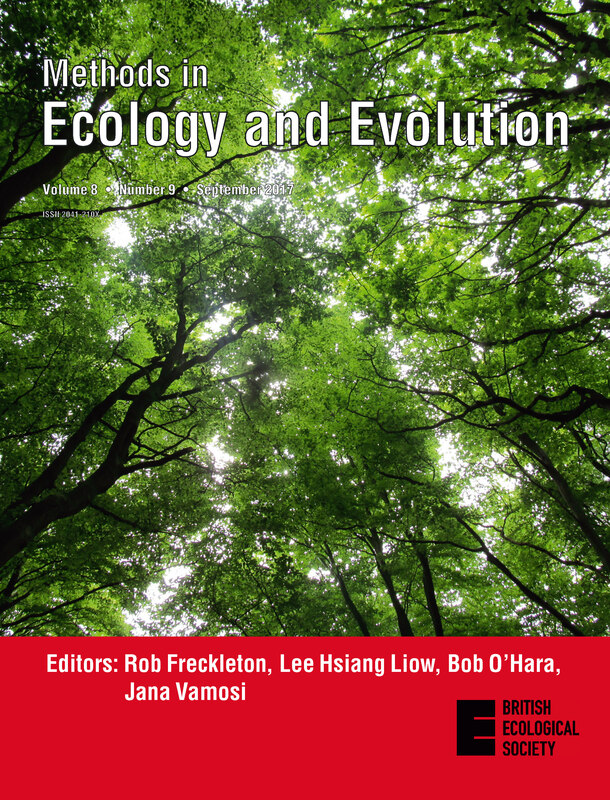 Our August issue also features articles on Diversity and Distributions, Acoustic Monitoring, Movement Ecology and more. Each growing season, fierce competition for limited resources takes place in mature deciduous forests. In this month’s cover image, branches and leaves from ashes (Fraxinus excelsior), beeches (Fagus sylvatica) and sycamores (Acer pseudoplatanus) try to outgrow their counterparts for accessing sunlight. A similar battle happens belowground in the rhizosphere (with roots and their associated soil microbes) to access nutrients and water. This picture was taken in mid-May (2014) at Wytham Woods (Oxford, UK), a 375-hectare site bequeathed to the University of Oxford in 1943, which has been since one of the most studied woodland ecosystems worldwide. Fine roots release a variety of organic compounds into the surrounding soil, which act as a source of readily-available energy for soil microbial decomposers (fungi, bacteria). This root ‘exudation’ can speed up their activity, and so the release of nutrients (taken up by roots) and CO2 (to the atmosphere). Despite their relevance, these effects have remained difficult to quantify in real, field conditions. In the Open Access article related to this image — The Automated Root Exudate System (ARES): a method to apply solutes at regular intervals to soils in the field — Lopez-Sangil et al. use a low-cost device to simulate the effects of increased root exudation rates, minimizing soil disturbance. Their results show significant increases in soil CO2 efflux following increased root exudation, but the effects were dependent on the presence or absence of aboveground forest litter. This entry was posted in Journal updates and tagged Bayesian, Biomass, epidemiology, Genomic Data, network analysis, phylogenetics, Phylogeography, qfasar, quantitative fatty acid signature analysis, soil CO2 efflux by Chris Grieves. Bookmark the permalink.